Botrytis isolates growing on a Petri plate with fungicide amended media. 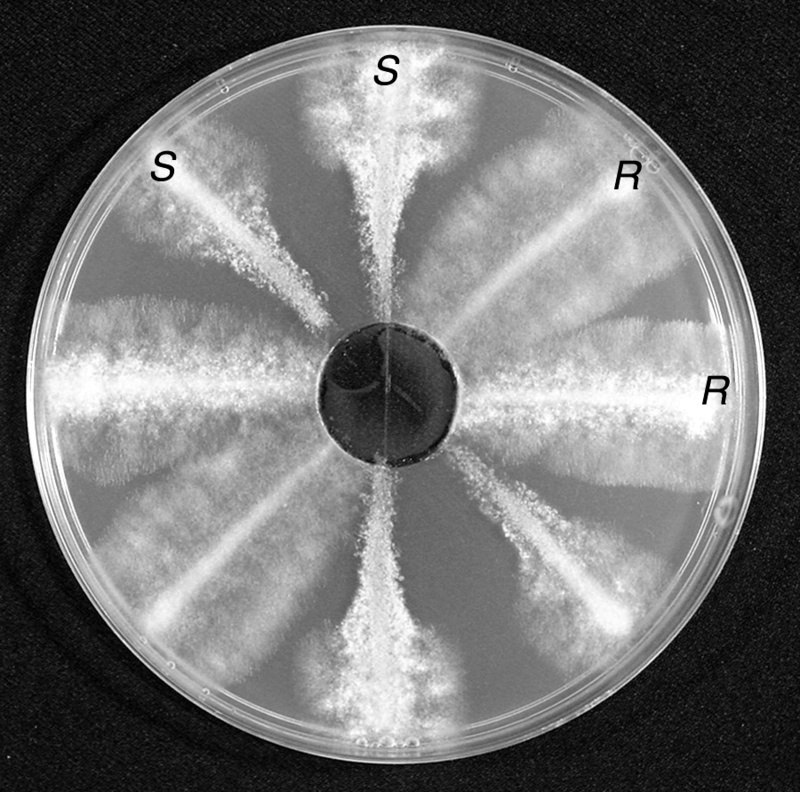 Fungicide is more concentrated toward the center of the plate. S = susceptible reaction where the colony is wider as the fungicide concentration decreases to the outside. R = resistant reaction where the colony is wide from low to high fungicide concentrations. Fungicide resistance is a major threat to disease control. Resistance is common among many plant pathogenic fungi throughout the PNW. Many new fungicides are at high risk of encouraging the development of resistant fungi. Although tactics for resistance prevention or delay have been developed, product trade names do not make it easy for producers to implement these procedures. This article will review current resistance management tactics for some of the groups and present a table that will help producers identify fungicide groups. Several chemical manufacturers have put together guidelines that will help summarize anti-fungicide resistance tactics. This group is called the Fungicide Resistance Action Committee (FRAC). The purpose of the committee is to provide fungicide resistance management guidelines to prolong the effectiveness of “at risk” fungicides. The main aims are to prevent resistance from developing and/or manage resistant fungi if they occur. The nature of resistance can be different even within the same fungal group. Fungi may develop alternative biochemical pathways around the ones that the fungicides are blocking. The blocked biochemical pathway may also be overwhelmed by the overproduction of precursors. Fungal cells may develop mechanisms to block entry of the fungicide and/or efficiently export the chemical out of cells. The result manifests itself the same way through disease control failure. In general, integrating cultural control tactics, use of fungicides at critical times of disease development and following the Rules below will help manage fungicide resistance. When first introduced the benzimidazole fungicides were more effective, and at lower rates, than anything else on the market. The new systemic nature of the compounds and their broad spectrum of activity encouraged the wide use of these fungicides. These fungicides could control many different fungal diseases including powdery mildews, Botrytis blights, leaf spots and blights, and root rots on a large variety of crops. There is even non-target activity on other organisms including earthworms. In some crops, such as strawberry, there is cytokinin like activity. Benzimidazole fungicides act by blocking the polymeriztion of tubulin preventing nuclear division of fungal cells. The mode of action is so specific within the fungi that simple natural mutations allowed for the development of resistant fungi. The resistance is also very stable within the population. Widespread use of benzimidazole fungicides caused wide spread development of resistance. The level of resistance in natural populations of Botrytis cinerea found in the Willamette Valley of Oregon is around 50%. Resistance can even be found in areas that have never been sprayed with benzimidazoles. Use tank-mixes with non-cross resistant fungicides (fungicides with a different mode of action). Alternating with other fungicides may not be of benefit for many diseases. Avoid the use of these products altogether in areas where resistance is widespread and stable. When first introduced the dicarboximide fungicides were highly effective against diseases caused by Botrytis, Monilinia, Sclerotinia, and similar organisms. These compounds were much better than anything else on the market. They are able to move into plant tissues but whether this uptake is direct or via roots has not been completely resolved. Application to partially open flower buds continues to provide disease control once the flowers are fully open. The greatest activity of these compounds is in preventing mycelial growth but spore germination is also reduced. Resistance to the dicarboximides is prevalent throughout the PNW. In some crops, such as strawberries, the populations of resistant Botrytis are so large that other compounds will work better. However, in other crops, such as prunes, the populations are small enough that anti-resistance tactics are effective. The general rule of thumb is that when the resistant population exceeds 40% then poor control can be expected in the current and subsequent growing seasons. The resistant population is not as stable or competitive as sensitive populations and declines gradually after the selection pressure is removed. How long a break is necessary before the effective reintroduction of the dicarboximide is debatable. Resistant populations of fungi decline but do not disappear and can rebound rapidly when these fungicides are used again. A ten-year hiatus in the use of iprodione resulted in the renewed use of this material for raspberry fruit rot in northern Washington during the 2013 growing season. Do not apply more than two applications of a dicarboximide fungicide per growing season or cycle. Make applications at times when disease pressure is highest. Maintain regular prolonged times without exposing the crop to dicarboximide fungicides. Use alternations and/or tank-mixes with non-cross resistant fungicides (fungicides with a different mode of action). This is a large group of fungicides that are highly effective against many different fungal diseases. They share a similar mode of action preventing the formation of sterols, such as ergosterol, which are needed in fungal cell walls. Each compound may act in a slightly different part of the biochemical pathway which makes sterols but the result is a similar spectrum of activity against various diseases. Most are very active on powdery mildews, rusts and many leaf spotting fungi including apple scab. DMIs penetrate the plant cuticle and are transported with the transpiration stream. They are not translocated down with the phloem. This systemic property has been called locally systemic or translaminer. DMIs also can have a growth regulation effect on plants producing shortened internodes and smaller greener leaves. Resistance to DMIs has occurred in several states and on several crops. Grape powdery mildew and apple scab are two diseases where resistance was first found. Little resistance has been formally documented in the PNW but it is highly suspected in many areas of the PNW, including for powdery mildew on cherry and grape. The nature of the resistance is such that increasing rates or switching to a slightly different chemical in the group may temporarily enhance control. Unfortunately the fungi quickly become adapted to each tactic. Repeated use of DMI fungicides alone should be avoided, especially under high disease pressure or against rapid cycling diseases such as powdery mildew. Use in alternations and/or tank-mixes with non-cross resistant fungicides (fungicides with a different mode of action) when multiple applications are required to grow the crop successfully. Use during the critical parts of the growing season or crop growth, especially when alternative fungicides are not available or effective. Adhere to the label recommendations in terms of rates and timing. Never use DMI products as a curative treatment as it encourages resistance development. For both grapes and apples, a maximum of four applications per season is advised. The phenylamide group is systemic in plants with apoplastic movement up from roots to shoots. They have both protectant and suppressive activity but only against oomycete organisms including Phytophthora, Pythium, and the downy mildews. Metalaxyl (or mefenoxam), a common member of this group, suppresses sporangial formation, mycelial growth, and establishment of new infections. It does not inhibit zoospore release, zoospore encystment, or initial penetration of the host. A result of its use on plants already infected is a significant delay in symptom development. Products in this group are used as seed treatments (for damping-off diseases), soil drenches (for root and crown rots), or foliar sprays (for foliar Phytophthora). The mode of action is so specific that many Phytophthora spp. have developed resistance to this group of compounds. Resistance to metalaxyl in the PNW has been documented in hops, potatoes and strawberries, which includes foliar and root diseases. Many restrictions have already appeared in product availability and labeling. Phenylamide fungicides should only be used in preventative treatments and never on a curative or eradicant basis. Foliar applications should only occur as tank or prepackaged mixes with non-cross resistant fungicides (fungicides with a different mode of action). The mixing partner can be between 0.75 and 1.0 of the full rate while the phenylamide should be used at the labeled rate. Soil applications of these products should never be used for airborne diseases. The number of applications should be limited from two to four per season and application intervals should not exceed 14 days. Use these products early in the growing season or during active vegetative growth. The Qol or strobilurin fungicides were derived from a naturally occurring compound found in the basidiomycete Strobilurus tenacellus that grows on dead pine cones. Improvements to the natural product included stability in sunlight and translaminar activity in plants. These compounds are very effective on a select but broad group of fungi. The spectrum of anti-fungal activity is different than other fungicides on the market. They are best used as protectants as they have limited curative properties (when compared to the DMI fungicides). These compounds act by inhibiting fungal mitochondrial respiration. Resistance to this group has developed worldwide. It has been documented for grape powdery mildew in the PNW and is suspected for cherry powdery mildew. Labels have been written detailing use strategies that should help manage resistance development. The complete nature of this resistance is such that rate increases will not be effective. For cereals, a maximum of two applications per season is advised while for fruits (including grapes) a maximum of three applications is advised. Use before diseases are expected to develop. Use in alternations and/or tank-mixes with non-cross resistant fungicides (fungicides with a different mode of action). Do not use more than twice before switching to another fungicide. R = Rotate or mix fungicides of different groups. U = Use labeled rates and at times of critical disease control. L = Limit total number of applications of any fungicide group in a given growing season. E = Educate yourself about fungicide groups and resistance management tactics. S = Select fungicides that have multiple sites of activity (such as groups M1, M2, M3, etc…). Some fungicides may be a combination of different ingredients from different groups. The fungicide trade name Pristine (or Pageant) contains two fungicides: boscalid (group 7) and pyraclostrobin (group 11). As you would expect, use of either alone would quickly lead to resistant fungi. Both materials work well against powdery mildews and when used in combination products like this are good for resistance management. However, only the group 7 material is very effective against Botrytis so even though there are two materials it is still like using a single use material. Botrytis isolates resistant to boscalid have emerged throughout the world. Management guidelines have not been developed for these materials. In a crop like grapes that needs to be managed for both powdery mildew and Botrytis bunch rot, use of these materials must be reevaluated. In this example, if you use products like Pristine for powdery mildew control then it should not be used for Botrytis management and vice versa. Delp, C.J. 1988. Fungicide Resistance in North America. St. Paul, MN: APS Press. Brent, K.J., and Hollomon, D.W. 2007. Fungicide resistance in crop pathogens: How can it be managed?. Fungicide resistance Action Committee Monograph 1. 2nd edition. Grabke, A., and Stammler, G. 2015. A Botrytis cinerea population from a single strawberry field in Germany has a complex fungicide resistance pattern. Plant Disease, 99:1078-1086. Johnson, K. B., Sawyer, T. L., and Powelson, M. L. 1994. Frequency of benzimidazole- and dicarboximide-resistant strains of Botrytis cinerea in western Oregon small fruit and snap bean plantings. Plant Disease 78:572-577. Olsen, J., and Johnson, K.B. 1995. Brown rot resistance research. Proceedings of the Oregon Horticulture Society 86:11-13. Pfeufer, E.E., and Ngugi, H.K. 2012. Orchard factors associated with resistance and cross resistance to sterol demethylation inhibitor fungicides in populations of Venturia inaequalis from Pennsylvania. Phytopathology 102:272-282. Lyr, H. 1995. Modern Selective Fungicides: Properties, Applications, Mechanisms of Action, 2nd ed. Villengang, Germany, and New York: Gustav Fischer Verlag.